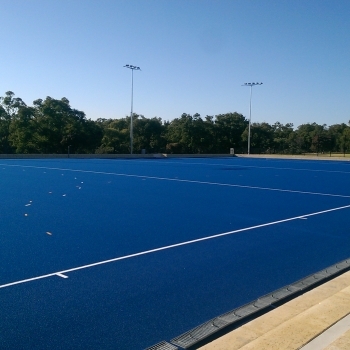 Our work in the Sport and Recreation area is featured by synthetic turf developments at Warwick, Guildford, Melville and the University of WA that represent state of art facilities for our leading hockey clubs. Porter Consulting Engineers has a particular interest in the design and supervision of the construction of synthetic hockey fields in Western Australia and is the most experienced hockey field designer in Western Australia. Our team have worked on 15 synthetic hockey field projects with 6 projects completed within the last five years and we are currently engaged to prepare the design and undertake the contract management for a synthetic hockey field at Lakelands Reserve for the City of Cockburn. Midvale Primary School Multi-sports Court – engaged by Programmed Facility Management (PFM) on behalf of Building Management and Works (BMW) to provide specialist consultancy services to assist with court resurfacing works to provide an acrylic playing surface with painted lines for netball, basketball and tennis. Our scope included design and documentation as well as providing tender assistance, technical advice and inspections during construction phase. Warwick Hockey Centre – engaged as part of the team assembled by Paterson Group Architects to provide specialist consultancy services for a new facility at Warwick Open Space. Construction commenced in 2016 with completion achieved in March 2017 before the new hockey season. Our involvement included development of concepts plans for artificial turf and grass fields, detailed design of hockey pitches and car parking areas, tender review and construction technical advice. University of WA Hockey Turf No.1 – engaged by the University, to design and supervise the installation of the turf no.1 resurfacing works. This project involved the removal of the existing surface, inspection and testing of the underlying asphalt and shock pad, rectification of root damage and shock pad removal, installation of new shock pad, and installation of a new synthetic surface. The Rio Olympic Games synthetic surface was selected through a rigorous selection process and technical review. Works were conducted in the off season with the field being completed and operational for the start of the 2017 hockey season. Guildford Grammar School – engaged by the school for the design development, detailed design, tender review and construction supervision of a synthetic hockey field to FIH National Competition Standards, located on the school grounds and completed in 2016. Our extensive experience with hockey fields in Western Australia, allowed us to meet the high expectations of the school in providing a WA leading design to lift the profile of the school. 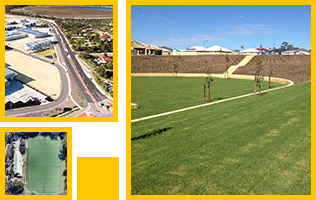 Duracraft Stadium – engaged by Melville City Hockey Club to design, document and contract administer the construction of a new synthetic turf at Morris Buzzacott Reserve in Kardinya. We were involved in the project from inception through to completion, this incorporated assistance with planning and funding approval, design development and management of a number of contractors who were supportive of the project. Aquinas College – engaged by the College Architect to assist in the detailed design and documentation of an artificial hockey surface and modification and redevelopment of surrounding grass playing fields. We interacted with the local hockey club and College to develop a facility that tied in with existing support infrastructure. This project involved detailed design, documentation and technical advice, as required, during the construction stage. The facility was developed essentially as a dry turf but we were able to future proof the site by installing a water supply system that could be expanded to support a full wet turf. Albany Senior High School– engaged by Pritchard Francis to assist with the relocation of public roads, development of new car parking and drop off areas along with detailed design of drainage and earthwork plans for the new oval and environs. We provided documentation of oval and drainage works, specification details as well as site surveillance checks during construction. Shire of Gingin, Regional Sporting Facility – engaged by the Shire of Gingin in 2009 to assist with the development of a hard court facility. Our scope included the design of car parking, access and drainage along with construction advice. Northam Recreation Centre and Jubilee Oval – engaged by the Shire of Northam in 2006 to provide design, documentation and contract administration for earthworks, hardcourts, parking and drainage at the centre. Norseman High School – engaged by Architecture Design Studio to provide advice on drainage for covered assembly area and provide specification for court resurfacing. 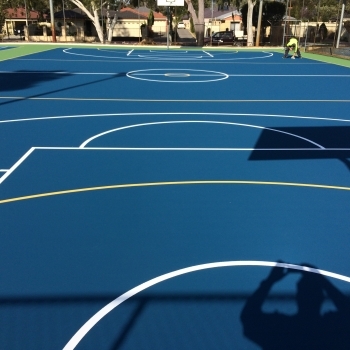 Samson and West Morley Primary Schools – engaged by PFM in 2016 on behalf of BMW)to design, provide specifications and provide construction advice for the upgrade to several hardcourt facilities.